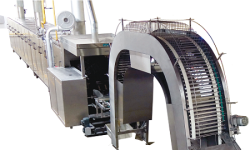 We are the first Indian manufacturers of baking machines for Wafer Biscuits, Ice Cream Cones and Rolled Sugar Cones. Established in 1991, R&D Engineers is India’s foremost manufacturer of baking machines for Wafer Biscuits, Ice Cream Cones and Rolled Sugar Cones. We are located in Hyderabad India. One die-unit can bake and produce only one type of cone/cup. The upper and lower moulds are interchangeable. In two/three hours you can change the entire die-unit and start to produce with another type of cone. It can be easily operated by any unskilled operators by performing a few simple tasks. Note:Earthing is absolutely necessary. The periodic heating and turning-off is controlled by means of a Thermotrol (Energy-regulator). Time can be adapted to the working speed and the consistency of the dough. The machine takes about 15-20 minutes for the initial heating. Set the "Thermotrol" to 100 Top/100 Bottom initially. After 10 minutes set it to 70/70 setting. Before starting regular baking operation, the moulds must be well baked out. For this purpose the baking surfaces are to be greased well, at best with bees` wax or veg. oil. Then the baking procedure can be started with low heat and maintained until the cones can be taken off the mould easily without breaking or sticking. During the baking period it must be seen to it that the baking surfaces are greased evenly so that the grease can slowly burn into the fine pores of the molds and cores, thus forming a sort of glazing. The initial heating of the machine should be made in a close state. The initial heating time amounts to be about 15 to 20 minutes. The dough prepared by the mixing machine is put into the batter tank. The dosimeter is dipped into the tank, each small cup of the dosimeter contains exactly the same quantity of the dough for each cone. 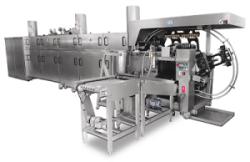 The tilting infusion device is dipped into the dough and hung up on the four halts so that the excess dough can drip down. Behind the dough vessel there is a flap with thread bolts by means of which the dough can be brought in an oblique position together with the tilting infusion device hung up on the halts. By this a simple regulation of the dough quantity is achieved. Thereby the even position of the dough vessel represents the maximum and the most oblique position of the vessel the minimum of the dough quantity. The tilting device is led by hand over the surface of the molds . The tilting lever is pulled forward with the the second finger of the right hand (Index finger). The dough now is poured into the cone molds.The tilting infusing device is taken out and dipped into the dough vessel to be filled again. Remove the desimeter and lower the upper mould. It is recommended before you close the die completely to DIP the cones of the upper moulds on the lower mould without closing it. Lift the cones up by 1" and DIP them again in the mould. finally close them completely. This is done to get a uniform distribution of batter in the Die cavity of the cone. Baking time varies from 1 to 2 minutes according to the size of the cone, quantity of batter, type of water, heating degree, etc. When you have closed the die, a little excess material (BURR) is forced out of the mould with a hissing sound. In order to obtain water vaporization as well as a perfect distribution (finish) of the product in the mould. After baking time (i.e. 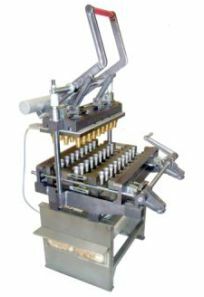 1 to 2 minutes), lift the upper molds but before you open the lower mould; the baked excess dough is removed from the surface of the molds by means of the cutting knife (delivered along with with the machine). After DEBURRING with the knife, open the lower moulds, the baked cones fall into the container placed below. Close the lower mould and repeat a new cycle. Ready made batter goes bad or becomes stale within 2-3 hours. So cleaning of the Batter tank/Mixer is absolutely essential at frequent intervals. The batter vessel is filled with water and the tilting device is put into it; to allow it to soak. After a few minutes rinse it with clear water. The vessel and the tilting infusion device must be put up for drying. Over a period of time some carbon residue may develop on the Die portion and the plate surface. It should be cleaned by means of a brass brush. Lubrication is essential for the smooth and safe working of the machine. It also prevents unnecessary "wear and tear" of the machine. A strict maintenance plan should be followed. 2) Check the enclosed chart for details.